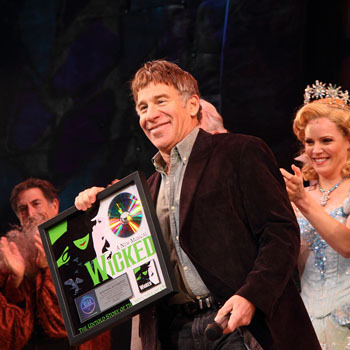 On Wednesday, November 10, producer Marc Platt presented creator Stephen Schwartz an award at the matinee of the Broadway musical Wicked celebrating the Grammy-winning Original Cast Recording, which has been certified double platinum by the Recording Industry Association of America (RIAA), commemorating sales of over two million copies in the United States. 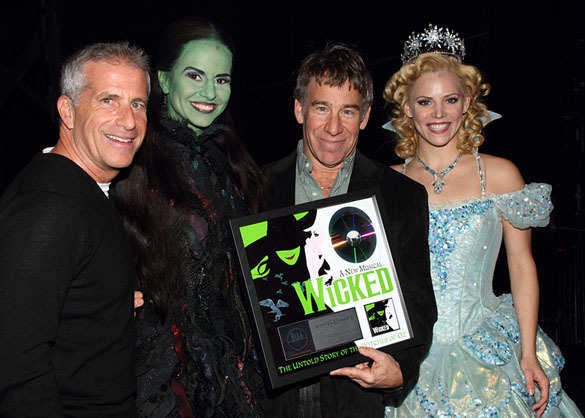 Based on Gregory Maguire’s novel of the same name, Wicked features a score by Schwartz and a book by Winnie Holzman. The production is directed by Joe Mantello, with musical staging by Wayne Cilento. It originally opened in 2003. Actresses Mandy Gonzalez and Katie Rose Clarke, who respectively play the roles of Elphaba and Glinda in the show, were on hand for the presentation. This entry was posted on Wednesday, November 10th, 2010 at 8:27 pm	and is filed under Uncategorized. You can follow any responses to this entry through the RSS 2.0 feed. You can leave a response, or trackback from your own site.